Posted February 22, 2008 in 2008/02, Uncategorized, z Archive. 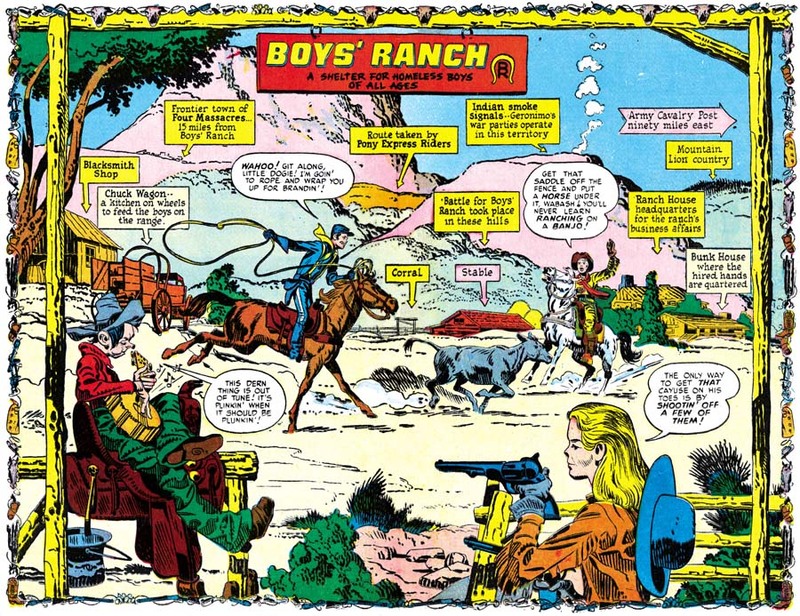 To achieve an understanding of Joe Simon as a comic book artist it is important to study some of the work that he did prior to meeting Jack Kirby. 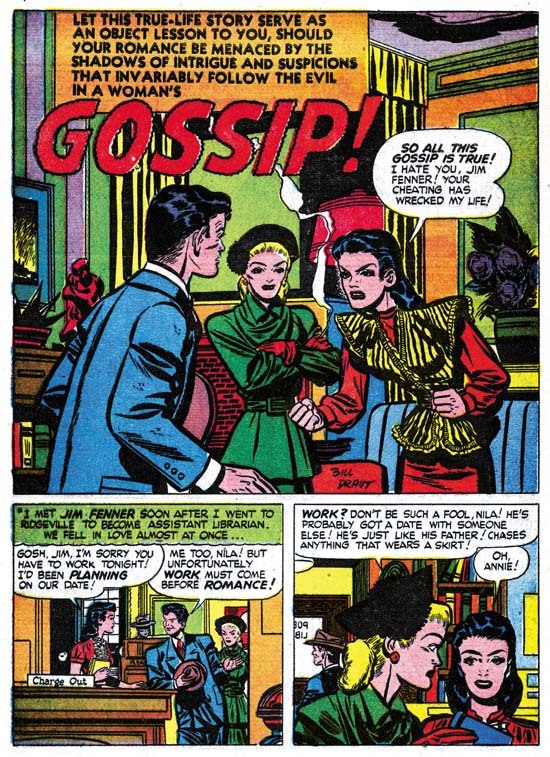 Unfortunately Joe’s initial efforts are from the early days of the golden age of comics so the comics that Simon’s art first appeared in are now rare and expensive. This would not be too great a problem if the work had been reprinted. Sadly that has not been the case, even a trade back reprint of the Blue Bolt stories failed to include Joe’s origin story. 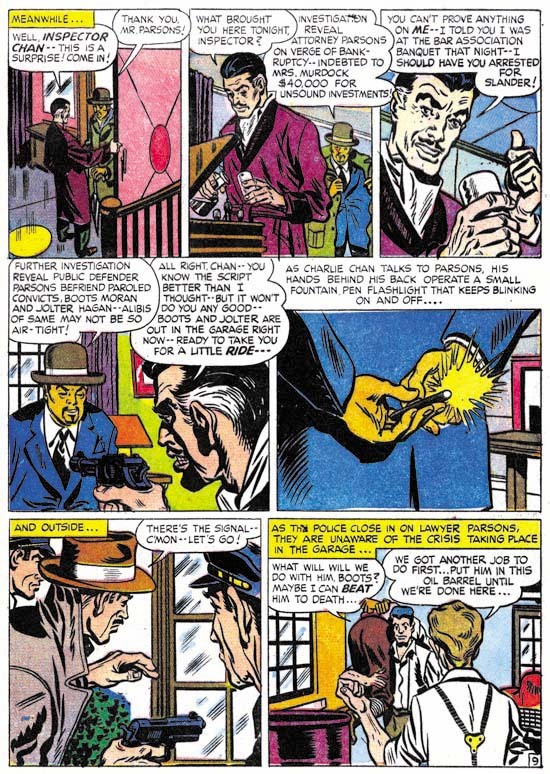 Fortunately Marvel has recently published Daring Mystery 1 for their Golden Age Marvel Masterpieces series. 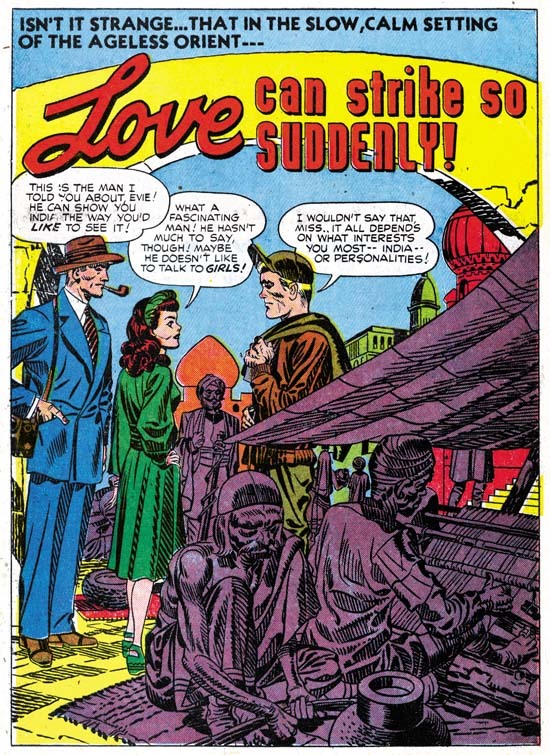 This volume reprints Daring Mystery issues #1 to #4 and therefore provides four or five early stories by Joe Simon. I hesitate on the exact story count because I keep going back and forth whether to attribute the one from DM #4 to Joe, although he has said he did it. 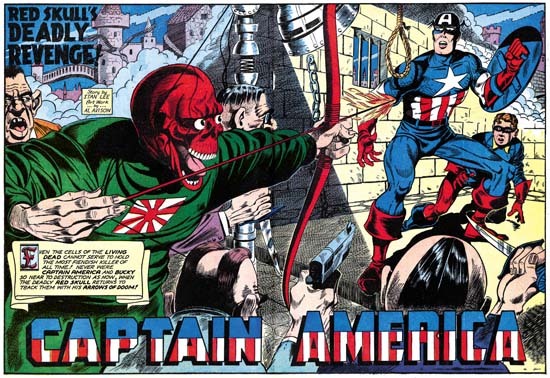 These stories include one of his first published works (the Fiery Mask story “The Fantastic Thriller of the Walking Corpses”) and all of them were done over the period before meeting Jack Kirby. 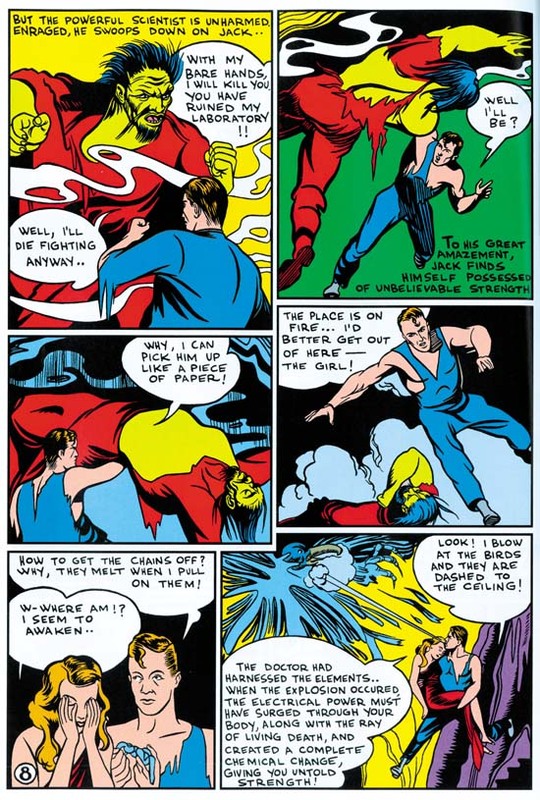 In the past I have been somewhat critical of the reprint job Marvel did for their Golden Age Marvel Masterpieces volume on the Human Torch. The restoration of the art for that volume included some modern re-inking. This not only diminishes its value for comic scholars but also makes what was some really great artwork look rather inferior. Therefore I was curious how accurate the restoration was done for Daring Mystery. I am happy to say that restoration of the line art looks very exact. The only place I found anything that could be described as re-inking was a case where apparently the original colorist supplied a shirt in one panel that Joe had apparently failed to include (see panel 4 of the original above). In this case the modern restorer adding line art that did not originally exist. Although I would have preferred it if the restorer added nothing that was not originally there, this seems a very minor and rare transgression. That is not to say I am completely happy about the restoration job. Marvel’s reprints are all recolored. 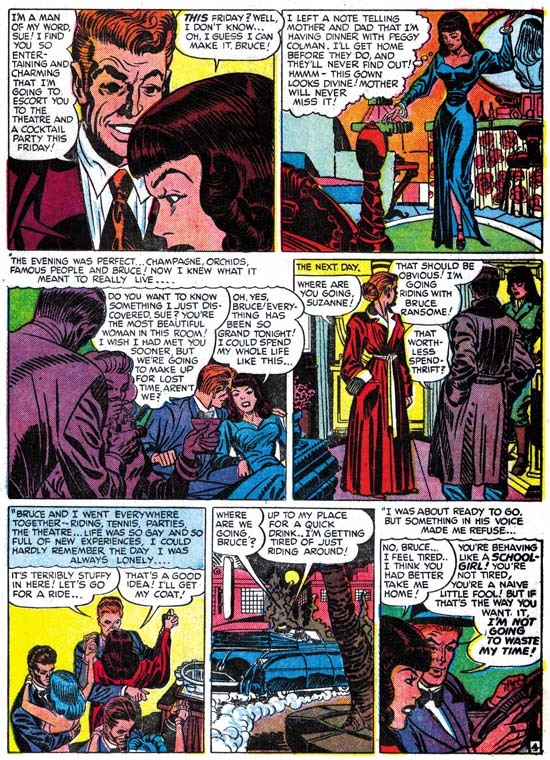 With modern presses and the fine resolution screening they use, recolored golden age comics have a distinct tendency to look very flat. While I am unhappy about this effect I have come to accept it provided that the recoloring remains faithful to the original. That had seemed to be Marvel’s most recent policy but it was not maintained in this volume. Some of the original subtle and not so subtle coloring was blatantly ignored. For instance as in panels 4 and 6 smoke the originally white with light blue touches became flooded with that blue. 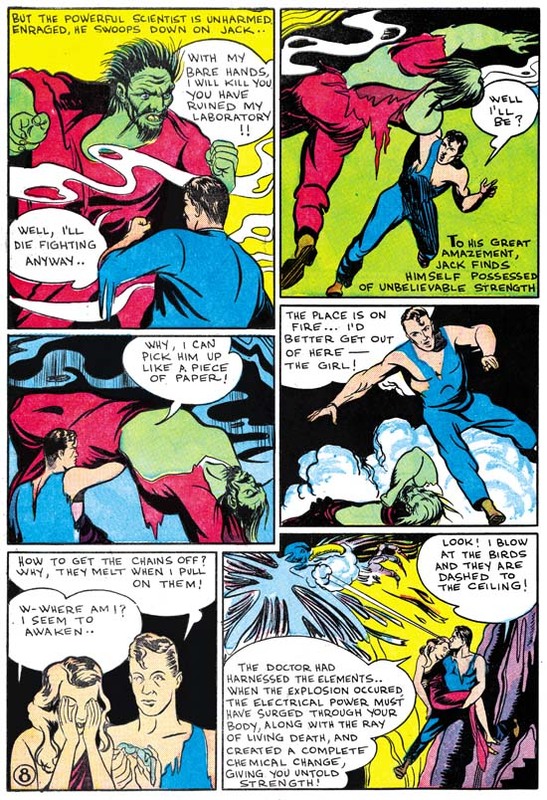 Even the giant villains clothing was turned to green color flesh in panels 2 and 3 while in panel 4 flesh became red shirt. All this suggests color accuracy was sacrificed for speed. 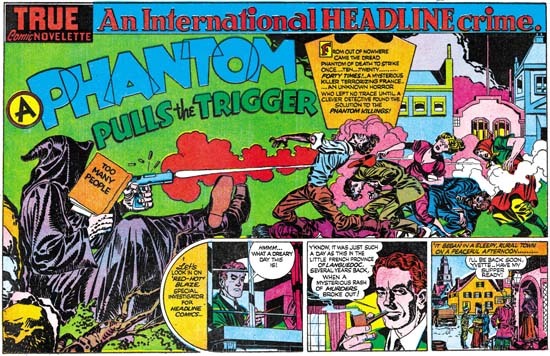 As a student of Simon and Kirby it was Joe Simon’s contributions to Daring Mystery that I am most interested in. There are a lot of others stories and artists contained in this reprint. 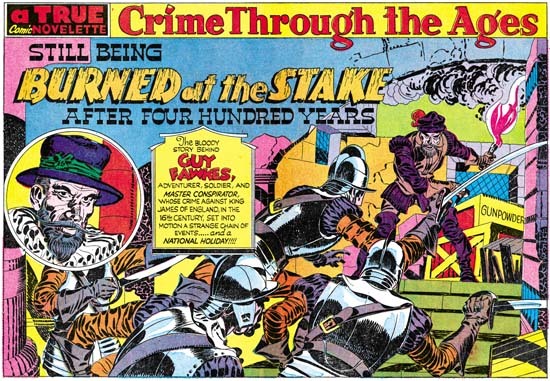 Frankly I am surprised that Marvel decided to reprint Daring Mystery at all, none of these features survived more then a few issues. The characters never became hits and none of them played any part of the modern Marvel universe. 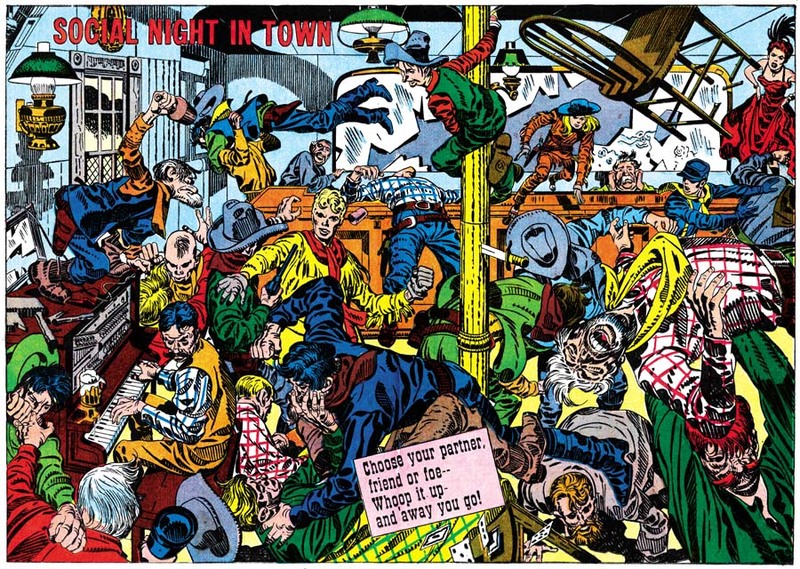 That is until recently when Marvel resurrected some as part of a mini-series call The Twelve, which includes Joe Simon’s Fiery Mask among others. In a way the absence of big stars is actually part of the charm of this reprint volume. 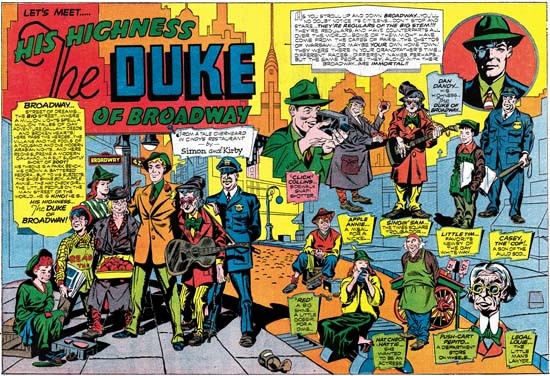 It is just filled with odd-ball heroes and quirky stories. 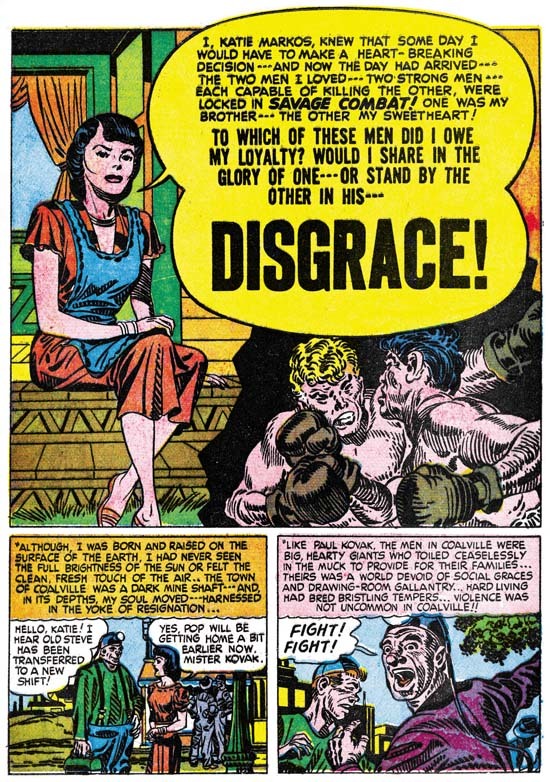 It even includes a story by Fletcher Hanks although identified in the volume as Harry Fletcher, apparently one of his pseudonyms. 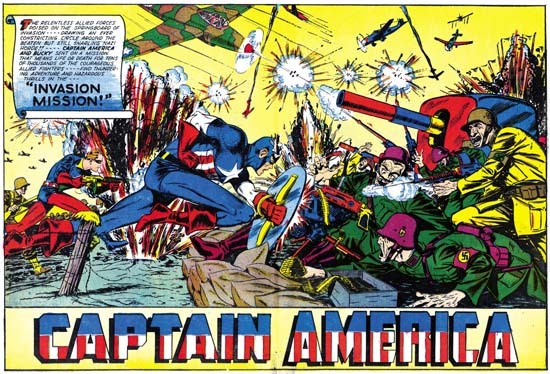 The volume has an introduction written by Ronin Ro, the author of the Jack Kirby biography “Tales to Astonish”. I am not sure why Ronin was chosen to introduce the book since Jack Kirby is nowhere in evidence. Still Mr. Ro is a talented writer and his essay shows he “gets” what gives this book its charm. Unfortunately Ronin Ro has made a mess of the history of the original Daring Mystery. It is no more accurate to describe Joe Simon as a writer then any of the other pioneer comic book artists; Joe’s stint in the newspaper industry was as a staff artist not a writer. 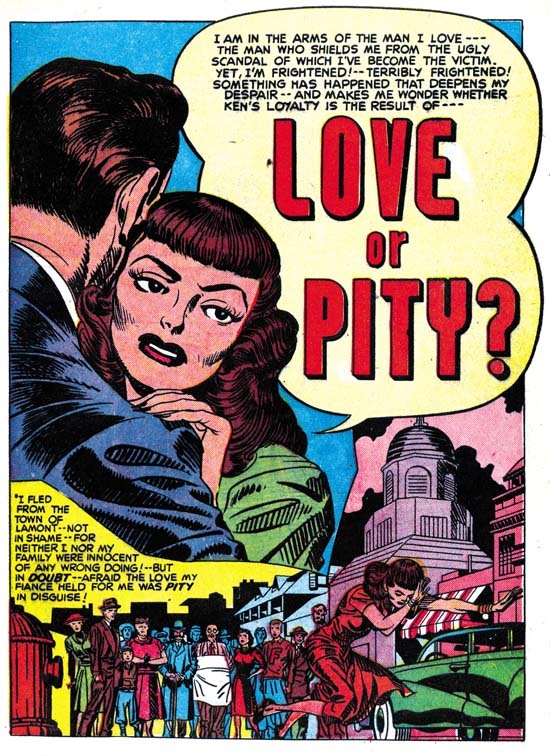 Nor was Simon an editor for Timely when these issues of Daring Mystery were produced, that would come later. 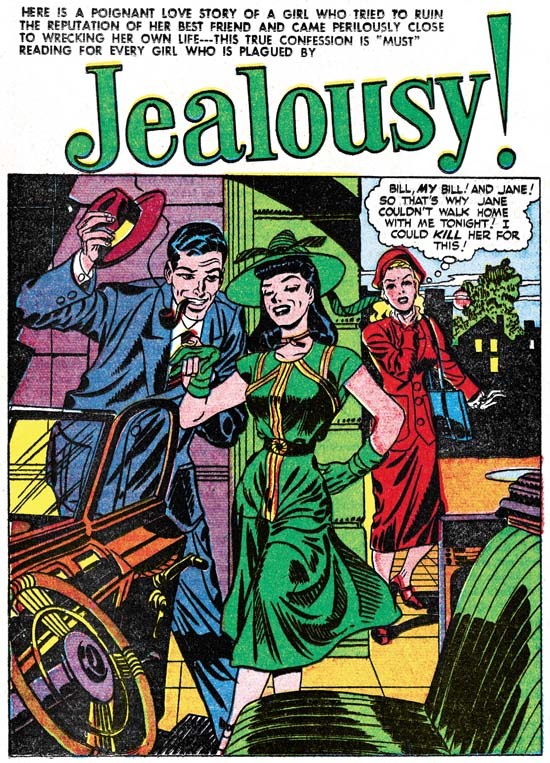 All Joe’s work in this reprint volume was originally was done for Funnies Inc. which supplied art to Timely in the days before Goodman started his own artist bullpen and all are from before he met Jack Kirby. 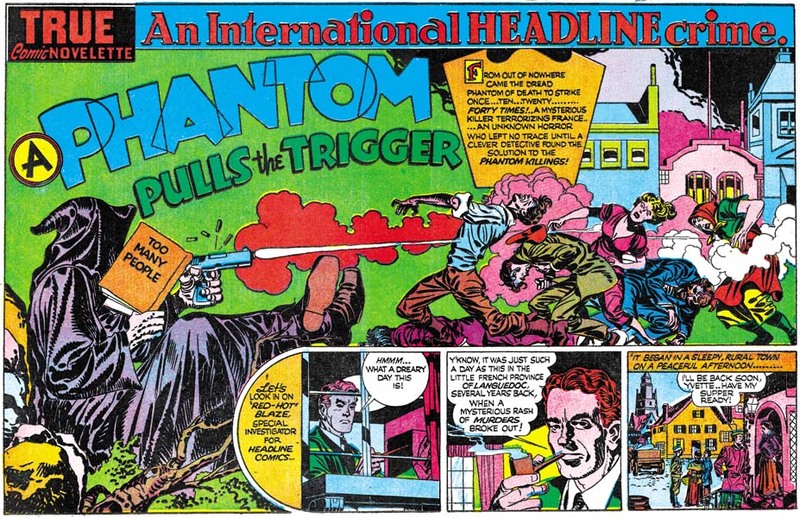 In a few weeks this Simon and Kirby Blog will be reach its second anniversary, my first post was on March 17, 2006. When I started blogging I really had no idea how long I would keep at it. Actually I still do not know but I have somehow managed to post once a week (on Friday or Saturday). Other bloggers post more often, that does not bother me and I hope that my readers do not mind either. Each blog entry has some research behind it, perhaps not as thorough as it would be if I were publishing something but more then I would do for casual comments on the places like the Kirby List. Even without the blog I would be doing that research, but writing about it allows me to organize my thoughts in a way otherwise not possible. It is surprising how difficult it can be to describe what can seem so obvious, let alone when things are not obvious at all. The effort is worth it because it brings with it a new level of understanding. This blog also provides feedback, perhaps not often as I would like, but the comments that are left are invariably quite thoughtful and informative. I offer a special thanks to what I like to think as my loyal opposition. Perhaps they do not always disagree with me but they always have interesting points to make. Rest assured even when our opinions do differ I respect and value the time they take. Besides I have been known to make mistakes and to change my opinion. Readers should not accept anything I say in my blog as unchangeable gospel. In recognition of my second anniversary I am going to have a contest. It has been a while since I had a contest and this time I have a real special prize. The winner will receive a color copy of The Red Raven Comics #1. 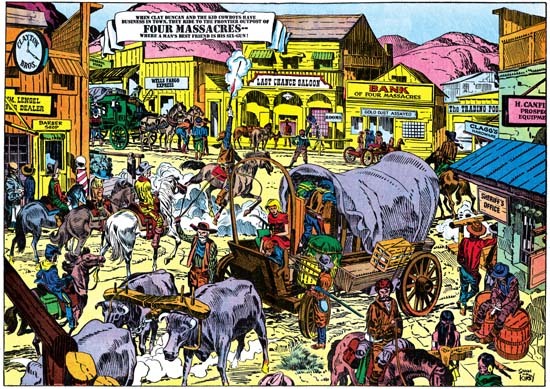 This is a slim hardcover volume with restorations of the cover and all interior art. 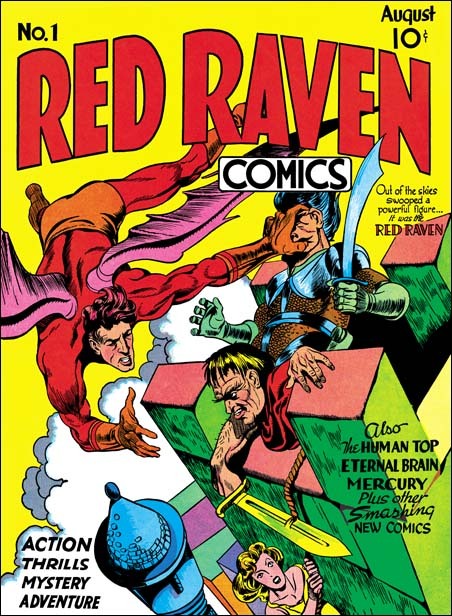 Red Raven #1 is an early effort by Joe Simon as art editor for Timely and has some nice work by Jack Kirby. Some of the stories are a bit odd, but that is to be expected from the golden age of comics. I wish I could offer it to all my readers but I am sure Marvel would slap me done hard if they found out. Maybe someday Marvel will get around to reprinting it themselves. Anyone can enter, not just people from the US. To enter the contest all you have to do is email me at hmendryk at yahoo dot com (you know the drill, replace “at” and “dot” with the appropriate characters). Include in the title the phrase “Red Raven Contest”. In the text of the email include your address. Please note I do not keep this information nor do I pass it on to anyone else. One entry per person. I will pick the winner at random on March 15. Good luck.